A system restore point on a Windows PC is usually our safety net but sometimes you may find the system restore failing and giving you the error code 0x81000101 with the words The creation of a shadow copy has timed out. If you are finding that same error during your system restore point, this guide should get you out of trouble. A system restore point is a Microsoft exclusive feature relating to Windows operating systems. If you are using a Windows PC more than the average person, it’s only a matter of time until you may need to call upon this feature. Essentially the System Restore feature allows you to restore the files on the computer to an earlier time period which you get to choose. The most common way to problem solve a Windows operating system is to try remembering the day when things went sour on your operating system and use the Microsoft Windows System restore feature to roll back at least a day earlier than that period. That gives you the chance to rewrite the history books using your computer and this time not make whatever decision you made last time which then lead to the mistake or error you were facing. These problems one may face aren’t always due to any fault of your own. Sometimes it’s something as simple as a bad driver you might install that lead to a problem large enough to want to use the Windows System Restore feature. Other times it might be a particular program which is causing problems. 1. Start creating a new System Restore point. 2. Open the WinX Menu. 3. Click on the Run option. 4. Type services.msc and hit Enter / Return on the keyboard. 5. You should now see the Windows Service Manager open up on your computer. 6. Check that the Volume Shadow Copy service is running. By default this is set to manual. 7. If it does not start for you, click the Start button and create a new System Restore point. 8. Those still facing problems can open the Run dialog box and type regedit. 10. From the top of the screen, click the Edit option in the menu. 11. Hover the cursor over the New option. 12. 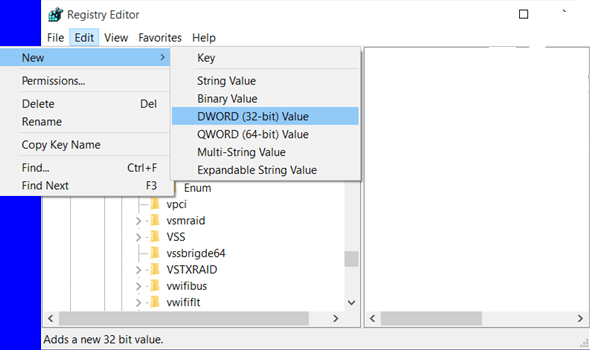 Now click the DWORD (32-bit) value from the next sub menu. 13. Give your new value a name. It doesn’t matter what name you decide to give your file. For arguments sake, let’s go with NewFileSize. 14. Double-click the mouse over that new value name. 15. Look where it says value data and enter the size you want to have for the shadow copy storage area. 16. Click the OK button and exit the Registry Editor. There; that’s all you need to help solve any “The creation of a shadow copy has timed out” related errors. Now when you see the error code Error Code 0x81000101 you will know what to do.